Last week I talked about my exercise routines, so for today, I'm going to share my usual eating patterns. I am a creature of habit, and I tend to have the same things over and over without really getting bored - I vary small parts like flavors, but in general, I always have the same things. I like the structure of it - it's easy for me to stick to. 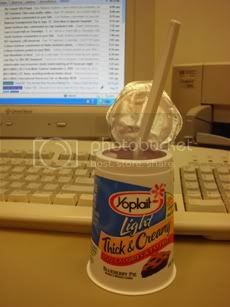 During the week, breakfast is a cup of Yoplait light yogurt, 100-110 calories. I prefer Greek yogurt, but to be honest, a Chobani every day is just not in the budget. I usually get the Thick and Creamy varieties, though, so at least it's close-ish in texture. My favorite flavors are Apricot Mango, Banana Cream Pie, and Thick and Creamy Cherry Cobbler. I teach two classes in a row in the morning, and since my stomach starts to grumble around then, I have a mini Luna Bar in between the two classes. They're 70-80 calories each, and you can buy a box of 18 bars of mixed flavors for about $10 at Target. I usually get the Lemon Zest/Peanut Butter Cookie/White Chocolate Macadamia box, because the box of caramel-y chocolate-y ones definitely contributed to triggering my binge back in February. After my second class, I head back to the office and heat up a Lean Cuisine, anywhere from 260-330 calories. Most often it's either 270 or 290, but on Fridays I have one of their mini pizzas for lunch, and those are all 300+. They cost about the same as the Weight Watcher frozen meals at Target, but I like the variety of Lean Cuisines better. My favorites are Chicken in Peanut Sauce, Roasted Honey Chicken, Chicken Carbonara, Tortilla Crusted Fish, and Three Cheese Stuffed Rigatoni. I eat these mostly for convenience: it's quick because we have a microwave in the office, and I don't have to worry about making lunch in the morning. I honestly am not sure if I could have a loaf of bread or deli meat/cheese in the house just yet - when I want a sandwich, I get one roll from the bakery and usually cook up a piece of chicken and top it with veggies instead of cheese. That works great on the weekends, but Monday through Friday, I need something quick! I teach a third class, then back to the office for office hours and tutoring. My afternoon snack, without fail: a 120 calorie bag of Teddy Grahams and a 250 calorie single-serve container of creamy peanut butter. It's not only delicious, but it gets me through my tutoring and workout. I'm really proud of the fact that I can keep the little containers of peanut butter in the house without bingeing on them - that's huge progress for me, who could easily eat an entire jar of peanut butter in a sitting (and may have done it before). I either go to the gym or come home and relax, and dinner is nothing big or fancy - I try and keep it to about 350-450 calories. There's always a protein involved - usually chicken, fish, or eggs - and some veggies. I try to restrict carbs at night - I always saw poor results at weigh-ins when I had too many carb-heavy dinners. Sometimes I will have rice or pasta, but usually I make lentils instead if I want something like that. 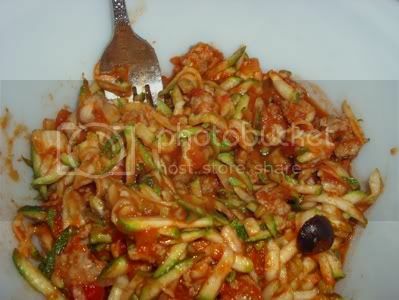 I've also fallen in love with shredded zucchini as a pasta substitute (and spaghetti squash, though that's going out of season soon!). I made a lot of vegetable soups this winter which were awesome, but now it's spring and I want salads and sandwiches! I have a 100ish calorie snack after dinner, usually an apple or a banana, but sometimes I'll splurge and have a Weight Watchers dessert - on Tuesday, for example, I was really craving cookie dough ... to the point where I wouldn't let myself buy eggs at the grocery store because I knew I had all the other ingredients in the house and I would have let it happen. With all my Dad stress, I didn't want a binge to be easily accessible, and I could already hear the voice in my head bargaining - you'll bake the cookies, you'll only eat a few - and my logical brain saying - who the heck are you kidding? you'll scoop it out with your fingers and then lick the bowl. So, I got the single-serve Weight Watchers Chocolate Chip Cookie Dough ice cream treat. There are two in the package, 170 calories each. I ate one, and it was unbelievable. Completely delicious, but not just that ... I savored it. I don't think I've ever really savored an ice cream treat before, so it was like tasting it for the first time. I was totally satisfied, and the Binge Monster retreated into his cave. So that's it: about 1200-1300 calories a day during the week. About once a week I have a bigger dinner or more fruit/snacks to get it to 1400-1500 to shock my system - I have to mix it up and always keep my body guessing. I try and do the same on the weekends, about 1300-1400 calories. I have fewer packaged snacks on the weekends (the mini Luna Bars, Teddy Grahams, and peanut butter are Monday through Friday only) but I tend to eat more fresh fruit and a bigger lunch than dinner since I am more active during the day on the weekends (vs. at night during the week). What about you? Do you have a food routine or do you try and mix it up every day? Are there any brands/products you totally swear by and can't live without? Your self-control amazes me! I don't think that I could stick to a 12-1300 calorie a day eating goal. I definitely have things that I shouldn't even buy. Granola bars for one. I love them - if they're here and I start to feel snacky I can easily eat a box over the course of an hour in the afternoon. Yet I buy them anyway, "for the kids." Ha. Kids. They might get one. ps - I've been lurking for a while, you're seriously motivating me to make better decisions (when I'm not scarfing down granola bars), thanks! I cannot live without my Joseph's Pita Bread (60 calories for the whole pita). I'm also a creature of habit. I eat the same things over and over again without fail. I do this at restaurants too, which may be a tad boring but it works! I am a very routine eater, mainly because I am picky and there isn't that much I will eat.